Western news networks and Hollywood have been cheerleaders for what they call the rebels, which in reality are a string of terrorist groups cast as freedom fighters, Patrick Henningsen, a geopolitical analyst at 21st Century Wire.com told RT. 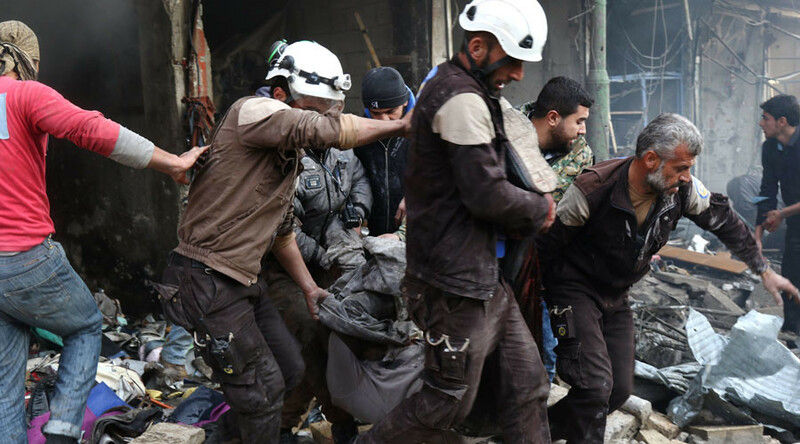 A documentary on the work of Syria's White Helmets rescue group has been nominated for an Oscar. The film praises the work of the group, despite its extremely controversial background. One of the recent scandals surrounding the White Helmets' work in Syria was the group's 'Mannequin Challenge' video. The rescue workers performed a stunt with a fake rescue as they staged a scene of saving a person from the rubble. RT: What do you think of the nomination first off? Patrick Henningsen: Well, first off it is probably in the wrong category. Rather than ‘best documentary,' the Oscar nomination should be for ‘best theatrical performance,’ or maybe even open up a new category called ‘best propaganda’ film. This film itself is not a real documentary. All of the footage used in the film was provided to the producers by the White Helmets themselves. This film production crew - Netflix productions - did not film any of the so-called rescue scenes. So what this film is essentially a PR cushion for a $100 -150 million covert op, which is basically an NGO front funded by USAID, the British Foreign Office, various EU – member states, Qatar, and other various and sundry nations, and members of the public, who quite frankly in my opinion and many others, have been duped into donating their money for this rescue group, that is anything but. It essentially functions as a support group alongside Al-Nusra and al-Din al-Zenki and other known terrorist groups operating in Syria. That is a fact that has been proven by a number of eyewitness testimonies. We have a number of witnesses that we interviewed on the ground in Aleppo from 21st Wire and Vanessa Beeley. They all said the same thing: they were working with Al-Nusra, and they weren’t there for the public. So this was Al-Qaeda’s civil defense unit basically. RT: The White Helmets have quite a controversial background. Why do you think the documentary praising their work gets an Oscar nomination? PH: This is well-documented. We’ve got a firsthand eyewitness account, so has RT, so have many other independent media outlets. But it has been blackballed by the mainstream media because this is a media that has is so heavily invested in this narrative of the White Helmets as rescuers and victors of humanity. Basically it is a media mythology that has been crafted over the last three years, and which has been propagated by CNN, NBC, the BBC, Al-Jazeera, and the list goes on and on. — RT (@RT_com) 23 ноября 2016 г. All along these networks and Hollywood have been cheerleaders for what they call the rebels, which in reality are a string of terrorist groups, like Al-Nusra Front, like Jaysh Al Fateh, like Nour al-Din al-Zenki, and casting them as freedom fighters. The White Helmets are supposed to be the kind of fluffy sort of PR adjunct to what is basically covert radical Islamic terrorist operations running inside Syria, being funded by a number of NATO states and also Gulf States as well: Saudi Arabia, Qatar, and many others. So the White Helmets are a kind of PR tool that has helped recruit terrorist fighters, to recruit people for Al-Nusra. People in the West and Europe see these videos on the western media and they think: “Wow, these people are being oppressed, and all these people are saving lives,” and so forth. Plus the White Helmets can’t validate that they have saved – they claim 82,000 people that they have fished from the rubble. There is no list of names, no places, no dates, no time. There is no way to basically correlate any of these so-called 82,000 rescues with actual air sorties, with an actual air strike, which they claim are being done by Russia and Syria. They are embedded exclusively alongside terrorist groups. This is on video – we have multiple bits of evidence to back that up. — RT (@RT_com) 8 октября 2016 г. Even networks like Channel 4 in the UK have shown on their news reports Al-Qaeda with Nour al-Din al-Zenki while they are planning suicide bomb attacks in East Aleppo. Channel 4 quickly pulled that video down I think from the YouTube channel when this was pointed out by a number of independent media analysts. So the list goes on. We could say with George Clooney, or with some Hollywood celebrities endorsing the White Helmets, people will then take their lead and go and donate to them. They are aggressively still fundraising, even after receiving at least, what we know of, well over $100 million from Western and Gulf States. Essentially it is crowd-funding terrorism in a way if you consider the White Helmets are a kind of a PR tool for radical Islamist terrorist groups operating in Syria.